A new free CSS template has been released, and this one is a highlight. It is called “Inland”, and it is a multi-layout design with lots of options that are there if you need them – while still remaining very simple and easy to work with. 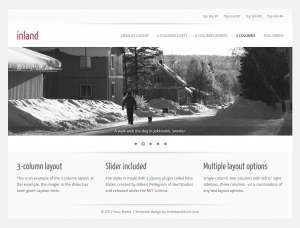 Inland features a jQuery image slider, multiple layout widths (both fixed and fluid widths) and content layouts for one, two or three columns with combinations of two different content layout options on the same page possible. The Inland template is written using valid and optimized HTML and CSS code, and it is tested to work with all modern browsers – including on mobile devices. To download, read more about the template and see screenshots or a live demo, see the Inland template page. Hi Andreas, i try to install this template but i have some problems, can you help me!? Hi Ramon, what exactly not working on your site, this is very simple template! Thanks for your wonderful template. I have a new website in 10 minutes.